The earth started trembling, the mud rammed walls started tearing apart, the walls started splitting and in the mere blink of an eye, nothing but ruins remained of our house” Bal Bahadur Damai, aged 58 bleakly remembers the earthquake of April 2015, the day he was peacefully having lunch with his wife inside his house – the day he lost his house that his grandfather had built. Since that day he and his family, like hundreds of other who lost their homes to the earthquake, have been living in a temporary tin shelter, yet if could have seen him recently, he is all smile and content. He is happy because after living 2 years in a temporary shelter that floods when it rains heavily and invites snakes during a warm weather, he will be able to celebrate this Dashain in his new permanent house. For a person who belongs to the lower sub-economic caste group, has no inherited wealth and low income that barely sustains his family, reconstruction of the house with the government provided compensation of NRs 3 lakhs seemed impossible. Bal Bahadur and his wife had given up the thought of living in a house with proper walls and a roof ever again. It was only a few months ago, Bal Bahadur recalls, when his wife was deeply troubled by the thought that may be their death will come earlier before they see a roof above them. Once an impossible dream for Bal Bahadur and his family is turning into a reality after attending the 50 days “On-the-job” mason training and 7 days additional course as stated by DUDBC curriculum. Having had worked as a semi-skilled part-time mason for past 12 years, it was only during the training he realized and understood why his two story house, that had stood tall from his grandfather’s time, fell the way it did. Since he had witnessed the fall of his house from in and outside, the haunting memories could flash back as the engineers demonstrated the drawbacks in their traditional construction methods. He has come to an understanding the use of through stones so that walls do not dilapidate, right thickness of mud mortar, and so on that contributes to making of a disaster resistant house. The training has proven useful not only because it provided the knowledge related to construction, but it also allowed the participants to understand that reconstruction of earthquake resilient houses can be done cost efficiently by utilizing locally available resources. Bal Bahadur shares, “I was amongst the many that believed the NRs 3 lakhs provided by the government was not enough to build a house while building safer houses was impossible.” But now, he has started rebuilding his own house using the stones, woods, and tin from his old house and buying other necessary materials, and this could cost him 4 lakhs rupees in total. He shares, “I want to build an exemplary house so that people, especially marginalized community like me, gain confidence to rebuild by understanding that constructing disaster resistant houses are possible with locally available resources at a minimum cost.” Once the construction of his house is concluded, he plans on forming a team of 5 and oversee the rebuilding of other houses. 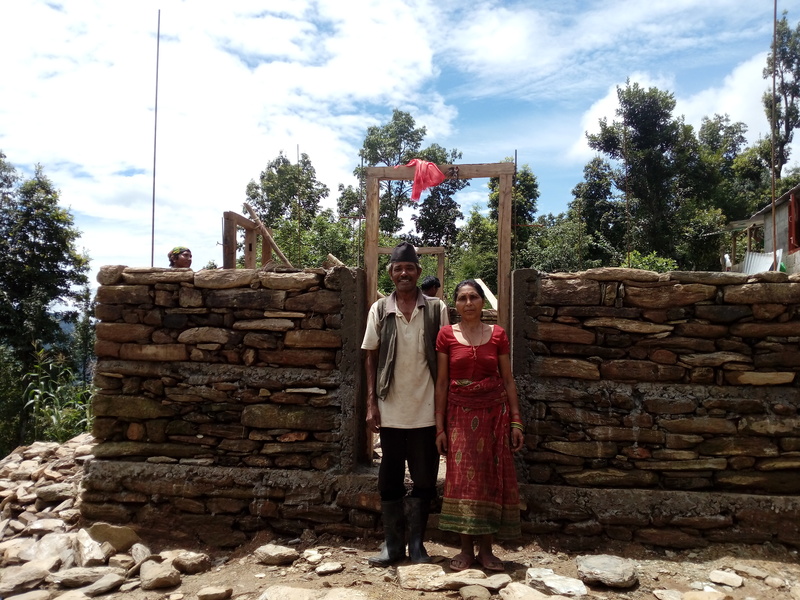 Bal Bahadur and his wife proudly stand in front of their house under construction. Suresh Kumar Tamang, aged 32, is another participant of the mason training. He was involved in a few construction works but lacked the technical knowledge regarding construction. The training has opened many doors for unemployed youth like Suresh. Though the work is slow during the monsoon, Suresh is hopeful that he along with other youths can work in the construction sector as the monsoon end and earn their living. ISAP, with the support of Peace Winds Japan and Akaihane Kyodo Bokin, has completed Mason Training Program for Earthquake Resilient Building Construction in Thulopakhar VDC and Jethal VDC of Sindhupalchowk, training 30 semi-professional construction workers and 5 practicing experienced masons. What are the Masons we Trained Doing Now? Eka Prasad Dulal, 63, has recently finished building one house and is busy constructing two of his neighbors' house at Pauwa-Ward 9, Sano Sirubari VDC in SIndhupalchowk these days. He has been earning his living as a mason for the last 40 years, but little did he know how to build earthquake-resilient houses until recently. After the devastating earthquake on April 25, 2015, 9 masons in Pauwa were trained by Institution for Suitable Actions for Prosperity (ISAP) and Peace Winds Japan (PWJ) to build earthquake-resistant houses. “For the last 40 years, we never thought about how much destruction our construction technique would uphold; we blindly followed traditional masonry that our forebears taught us” shares Dulal. Other masons, laborers, and house owners in the community share the same remorse, but the story does not end here. The training made masons’ aware of the shortcomings in their construction methods. “After the training, we have adopted certain changes in our construction habits. Now, we know proper techniques such as a need for tie-stones and methodologically tying walls with bands and so on. So, the houses we build now will not collapse easily”, said another mason, Homnath Dulal. Masons recall that on-the-job training by building demonstration/model house, now used for early childhood development (ECD), apart from the 7-day Mason Training following the DUDBC curriculum, was the most effective method for changing their habits and practices. “Such on-the-job training under the constant supervision of the engineers was the first opportunity to realize our construction blunders and change our traditional masonry habits,” Dulal elaborates while expressing gratitude toward the training. Rewati Dulal supervising and helping with the reconstruction of her house. Nearly 160 houses in Pauwa were destroyed by the earthquake. One of the trained masons, Kancha Man Thapa Magar, 59, shares that 9 trained masons will not only be rebuilding houses in Pauwa but will also assist semi-skilled masons and laborer of neighboring VDC to rebuild upon requirement. Training has not only helped in safer rebuilding but also has become a source of living for many. Magar now earns NRs 800 per day, while he used to earn NRs 1200 per contract for laying the groundwork for biogas plants at a household level which involved days of work. Other masons now earn NRs 400 to 600 per day by building through improved techniques, while their previous income was no more than NRs 350 per day. 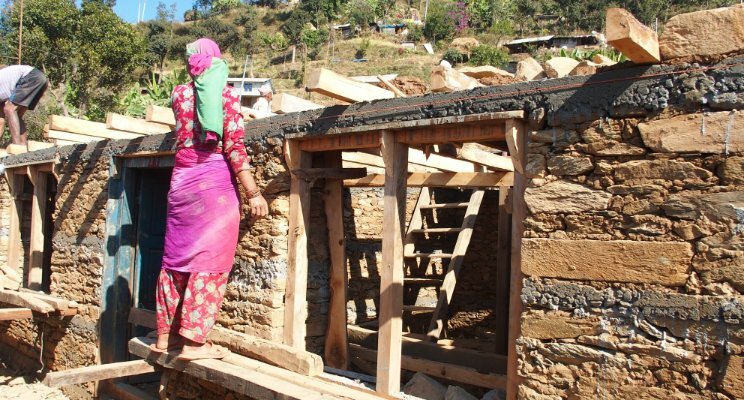 Semi-skilled construction workers of Irkhu VDC and Sanosirubari VDC in Sindhupalchowk were also provided similar training, and these 121 trained masons are helping to fill the demand of more than 60,000 masons for completion of reconstruction within 5 years. Bottom-up approach to development is often misconstrued to be either consultation with community members and targeted beneficiary leaders or a GO or NGO-led initiative that has shared decision making with local community people. However, a truly community empowering initiative has to community initiated, directed and shared with development agencies. It should offer more than helping hands and donation; it should offer reshaping communities that can take charge of their development. 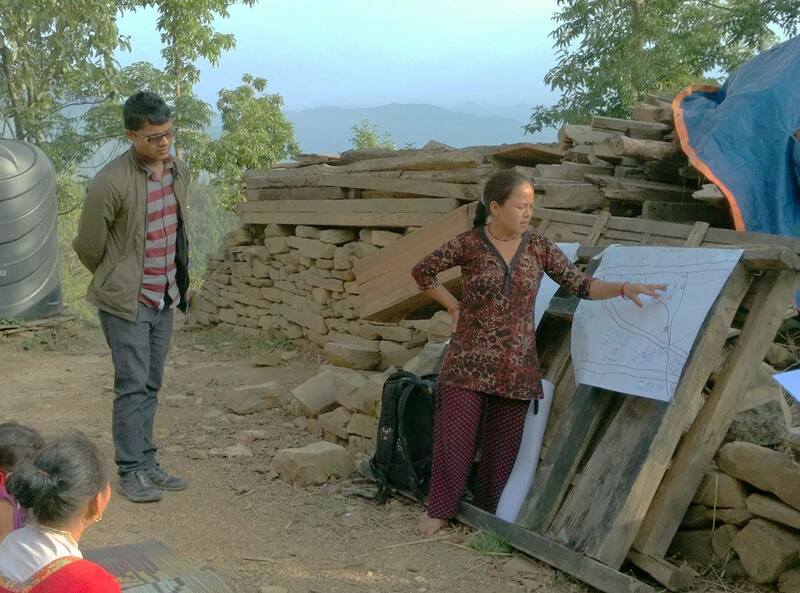 In the aftermath of the April 2015 Nepal Earthquake, ISAP designed a framework called Participatory Approach to Rehabilitation of Community Infrastructure (PARCI) to enable a demand driven project design for reconstruction of earthquake damaged community infrastructures such as water supply schemes, irrigation facilities, etc. 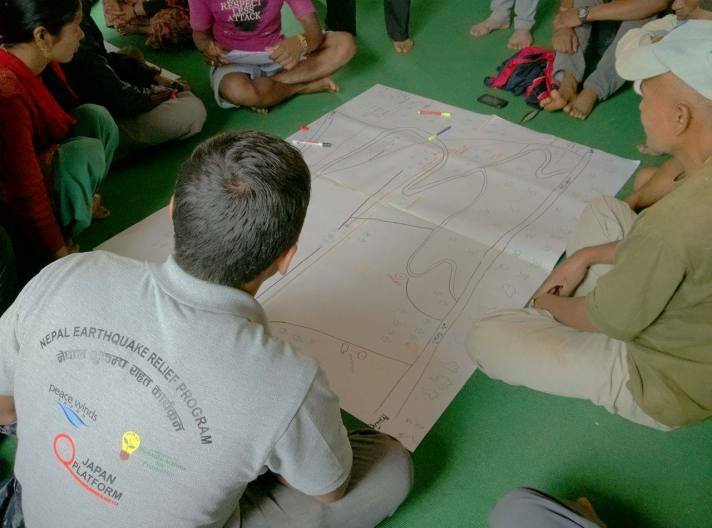 The PARCI process entails a series of seven interactive workshops facilitated by a WASH engineer and a social mobilizer that guides communities to understand each other’s needs, prioritize reconstruction efforts, mobilize resources and request assistance, overall leading the reconstruction process. The participatory approach starts with forming a PARCI group of enthusiastic community members, prioritizing women, and socially and economically vulnerable people, based on their interest toward the concept and working methodology of PARCI. Such inclusive group helps foster the environment of equality, along with representing infrastructural concerns of diverse communities. Four to six groups are formed for every VDC. This PARCI group represents the community and all reconstruction activities are done through this group in coming days. Between the PARCI workshops, the PARCI group interacts with other community members so that the whole community is informed of the process and has an opportunity to provide opinions and raise concerns and queries. Community members mapping their community during the second day of the PARCI activities. The sixth workshop is on resource identification, taking advantage of complimentary capacities and resources of other agencies. The community identifies government agencies, organizations and community resources that could further assist in rebuilding their infrastructure. The community in Pouwa, Sanosirubari-9, is one of the examples where the cost of their priority infrastructure; i.e. reconstruction of water lifting system, exceeded the given budget. But, the budget constraint did not lower their spirit of reconstructing the desired and need water lifting system. They visited district office and requested budget for construction of two water tank in which ISAP would provide materials for electrical work. There are many other instances where the locals on their own have pulled resources for the reconstruction work by combining with other agencies, channelizing development funds from VDC, and raising funds among their own. On the seventh workshop, the members of PARCI group take charge of each part of the plan based on their personal qualities and skills required to carry out the allocated task. The group holds the responsibility for registration if required, purchases, identifying trained manpower, excavation work, and construction. The workshop ends with re-thinking about possible problems in the plan, finding out possible solutions, and making changes in the plan if required. They also develop a procedure for monitoring the project progress. From the very first day of PARCI, the PARCI group is led to the path of leadership, from introducing oneself in front of masses to developing and executing the project to taking charge of each part of the reconstruction activities. Even for those who are intimidated by public speaking speak out sooner or later, says Mr. Pankaj Parajuli, Executive Director of ISAP as they realize that their infrastructures will never be considered for reconstruction if they don’t forward their problems in the workshops and community meetings. Finally, when asked about what achievement that strikes out the most while implementing PARCI workshop as a social mobilizer, Mr. Gopi Dangal shares that seeing how economically and socially vulnerable groups who have rarely been given chance to voice their need have come forward in decision making once they are given important positions is impressive. One of the PARCI group members presenting the designed community map and the overall water supply layout to the group. Utilizing the PARCI method, ISAP together with its implementation partner Peace Winds Japan assisted the locals of Sindhupalchowk to reconstruct 38 different water supply schemes which had been damaged by the earthquake. Cost contribution from Peace Winds Japan/ ISAP ranges from 5% to 85% of the total scheme costs while the rest are born by various other agencies, locals or government organizations. Imagine you are 10 years old and study in the fifth grade but you can read Nepali and do Math only as a first grader. Simple subtraction and division, which your classmates do with such ease, are your biggest challenge. Imagine what must be going through a 10-year-old’s mind when he or she is often accused of being lazy, irresponsible and incompetent by their teachers and parents. This is what Nibesh, 10 years old in grade 5 at Jana Jagriti School, goes through almost every day. While having reached grade 5, Nibesh was only reading Nepali and doing Math as a 1st grade-level when we met him during our LITNUM, a literacy and numeracy assessment tool, in Heatuda, Nepal. As we often found, Nibesh lacked behind in other subjects as well due to low foundational understanding. At this rate, chances are this child will fall among more than 40 percent of those who do not make it to grade 10 as per Nepal Education data published by the Ministry of Education. Dropping out of school unprepared at such an early age can lead him or her to become a child labor or get married like many other children. Moreover, without foundational literacy and numeracy skills, they stand little chance of breaking the intergenerational cycle of poverty they were born into. Sharing the common value that every child deserves a second chanc e of being able to change their own stories for the better future with Changing Stories, a Danish non-profit organizing, Project Biswas that offers Remedial Education Course (REC) was envisioned. We started a REC as a pilot project in Hetauda, where we trained 5 loc ​​al ​youths and provided them with the necessary teaching materials to provide the remedial classes to 75 students of 5 public schools. We chose to work with local youths to help these youth realize that they are the future of their community and hold the power to bring changes in their own lives and that of others. 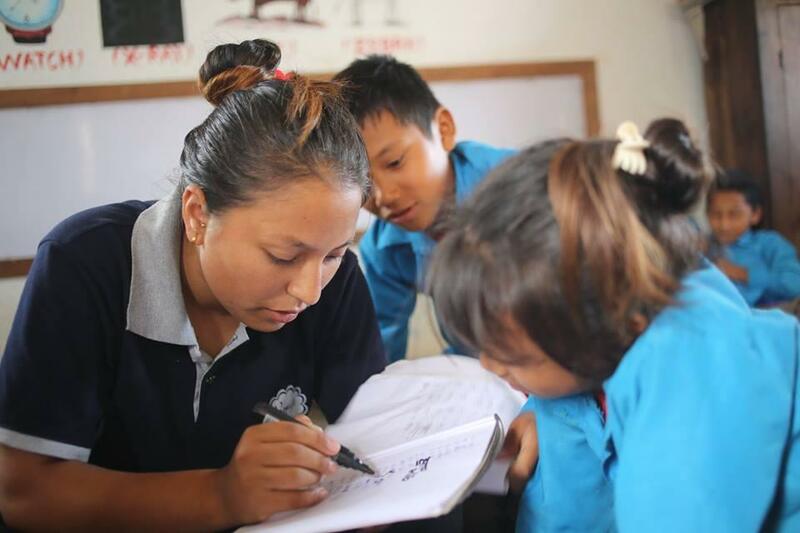 With the continued effort of local youths, the enrolled students managed to progress at an average of 2 grade-levels per student in Nepali and 1.28 grade-levels per student in Mathematics. At Baseline, only 3% of students were reading Nepali at a grade-2 level or above while at the end of the courses, that number was 69%. Similarly, for solving a grade-2 level subtraction problem those numbers were 3% and 71%, respectively. Our REC-model was able to do what public schools have often failed to do: drastically improve learning outcomes for low-performing students due to local of resources. Even though we were able to achieve so much in less time, the process was not without challenges. The month-long monsoon holiday had a negative impact on the attendance of some students despite the fact that parents and the students themselves had initially agreed to attend class during the holiday. Strong monsoon and the flooding also affected the attendance of the students, as well as the possibility of field visits from CS staff from Kathmandu. The lack of a local office and staff greatly hindered our ability to support our fellows. The establishment of a local office is one of the major changes that will be made to subsequent scale-ups that we expect will have a positive influence on fellows’ moral and their effectiveness inside the classroom. We are now planning a scale-up of the remedial education courses to 8 schools by winter 2017.